So....have a solar powered repeater site? Need a low power, portable, 900MHz repeater for hamfests? The TK-431 used as both a repeater receiver and transmitter or just as a low current consumption repeater receiver at your solar site is an awesome combination! I decided to share pictures of a portable repeater that was designed and built by the late Gene Colson, W7UVH (SK). 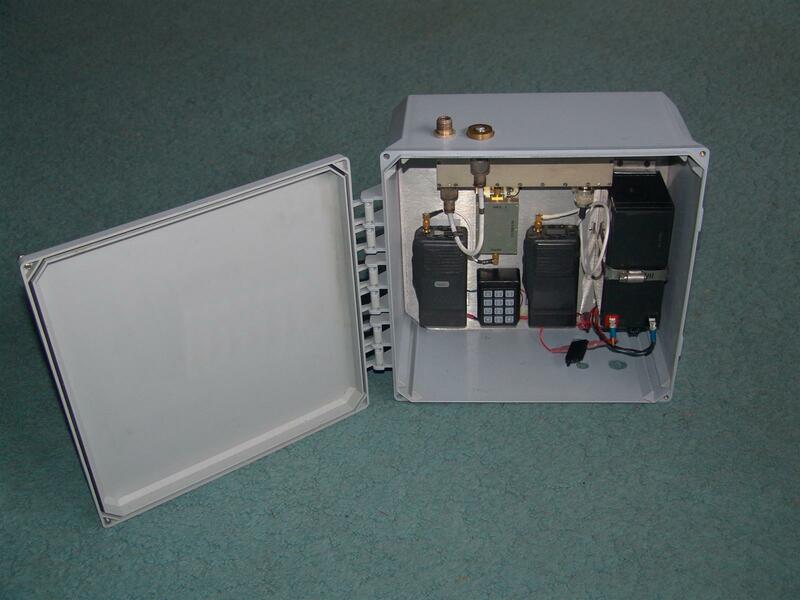 This portable repeater is housed in a plastic weather-resistant box. If you live in Washington State (where I call home) and have done the Ham Swap Meet circuit chances are you have seen or used the 927.9875MHz, QT 114.8Hz repeater before. This repeater uses an elevated feed mobile antenna mounted directly to the plastic housing. Note that the antenna terminals on top of the box can be switched between NMO and N-Type connectors! Internal view of the repeater; unit uses a 12Vdc sealed lead-acid battery for primary power, and has a charging connector on the bottom of the plastic weather-resistant box. The repeater consists of a TK-431 Receiver and Transmitter with 1 Watt output, as well as a receiver preamp, repeater controller, and notch-type mobile duplexer. The sealed lead-acid battery is 12Vdc and supplies the receive preamp directly, however, the TK-431's require 7.2Vdc for power, to accomplish this a NTE935 adjustable voltage regulator was used. Close up view of the repeaters notch-type mobile duplexer and receiver preamp. You can also see that the repeater antenna terminal can be switched to allow the use of a NMO or N-Type antenna connector on the outside of the weather-resistant plastic box. Close up view of the repeater controller with DTMF pad for programming, as well as the receiver preamp, repeater receiver, and repeater transmitter.